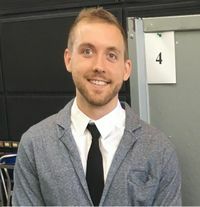 Alex Anderson recieved his BScH from Wilfrid Laurier University in 2017, and began his foray into microbiology as a diagnostic laboratory technician at the Public Health Ontario Laboratories where he became fascinated with microbial cell surface structure and function. Alex is currently a Masters candidate in the lab of Dr. Joel Weadge, alongside Michael Suits, at WLU where he studies the structure and function of CAZymes responsible for the biosynthesis, modification and export of cellulosic materials involved in biofilm formation in Gram-negative pathogens. His most recent work includes the structure of the cellulose phosphoethanolamine transferase BcsG, essential for extracellular matrix assembly in E.coli K-12 and S. enterica. This page was last edited on 31 August 2018, at 11:06.